This is the first Paula Deen recipe I’ve tried, and it’s a winner. Simple, fast, easy, not a lot of ingredients. Plus it’s not as rich or dense as your usual cheesecake. The crust is pretty clever–a Nilla wafer at the bottom of a cupcake liner. 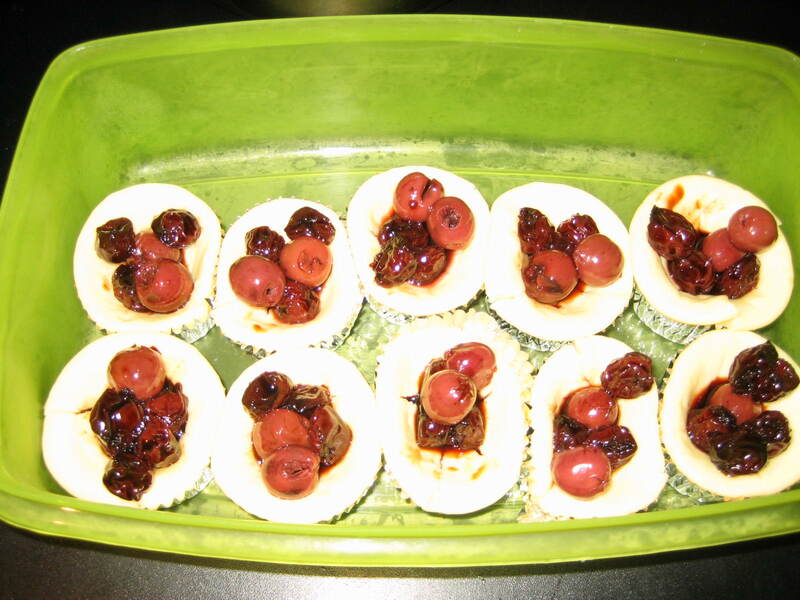 Paula covered her tarts in blueberry pie filling, but I had a jar of cherries from Trader Joe’s handy. For the cherry topping, stir together cherry juice from the jar, balsamic vinegar and dark brown sugar in a saucepan in a 1:1:1 ratio. Reduce it over medium-high heat until it thickens, then add the drained cherries back into the thickened sauce and coat them. Wait until the cheesecakes and topping have both cooled before spooning the topping on. Update, September 13, 2012: I revisited this recipe recently, adding 1 teaspoon fresh lemon juice and the zest of 1 lemon. That made it even better.